Choo-choo: It’s the Santa Train! Last week one of our readers suggested we do a little research about the Santa Train. I had no knowledge of this train and the research was fun to get into. There are lots of Christmas trains and Santa Expresses all around the U.S. but there is only one true Santa Train. That train is the one that travels each year from Shelby, KY to Kingsport, TN on the Saturday before Thanksgiving. The “Santa Special” started in 1943 as a way for a group of Kingsport businessmen to show appreciation for the patronage of all the coal workers throughout the region. The train has made an annual journey every year since. In those early years during WWII the train was most likely the only sign of Christmas and source of gifts for those in the remote area. Over the years the size and scope of the train has continued to grow. Today the train follows a 110-mile route from Kentucky, through Virginia, and ending in Tennessee. The train passes through as many as 30 towns along the way and makes about 14 stops. The train hauls more than 15 tons of goodies and supplies valued at as much as $500,000. There are gifts, toys, stuffed animals, games, hats, gloves, mittens, and more clothes. Candy, crackers, cookies, popcorn, and gum also come aboard the train. At each stop volunteers hop off the train and hand out bags of items packed based on the age of the children. Soft items and candy are tossed by Santa and friends at the back of train. 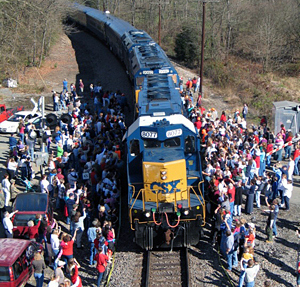 Crowds as large as 1,000 gather around the tracks in anticipation of the arrival of the train. These gifts might be the only Christmas a child in Appalachia will see. 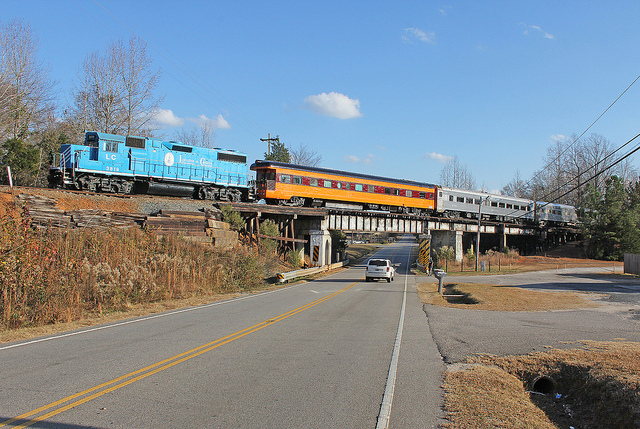 Read a great account of one family at the train on the MTSU student news site Sidelines. The train takes donations from anyone at anytime. You can mail handmade items, monetary gifts, or other toys to the Train. Find all the details on the official website for Team Santa Train. Private donors supplement the corporate sponsorships from CSX railroad, Food City, Dignity U Wear, and the Kingsport Chamber of Commerce. The Chamber is the lead sponsor and source of all the details for the train and continues to make improvements to the whole experience. In recent years they have added celebrity volunteers to the train like Allison Krauss, The Judds, Patty Loveless, Travis Tritt, Kathy Mattea, and, in 2012, Thompson Square. A $5,000 scholarship is awarded in connection with the train to a high school senior from one of the schools along the train’s route. The volunteers gathered by the Chamber tell all that they are the true gift recipients through the joy and happiness of helping do more for others with less. That’s the true spirit of Christmas after all isn’t it? Watch this video showing some of their joy. It’s the time of year when friends ask “Where are you vacationing this summer?” as openers of conversations. 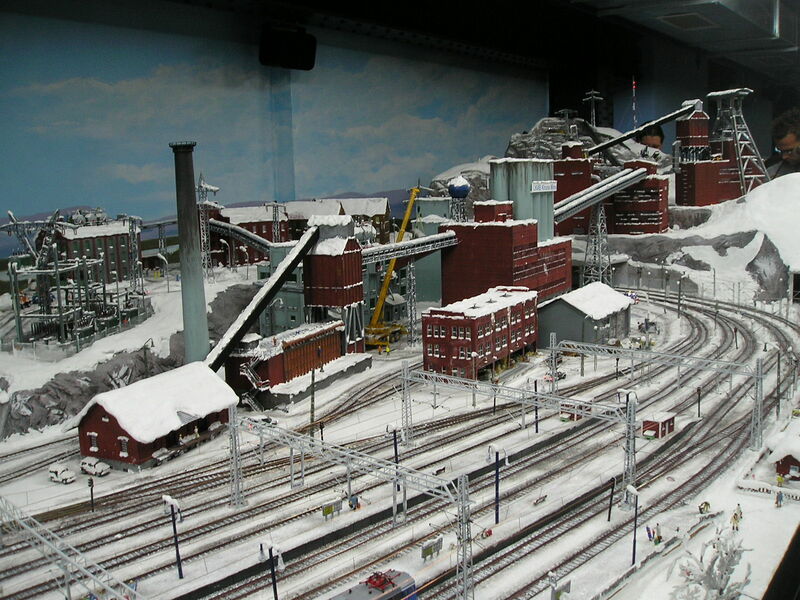 The answer one of my students gave me this week was “Hamburg, Germany.” He is a big model railroading enthusiast, and Hamburg has the world’s largest model railroad, Miniatur Wunderland. 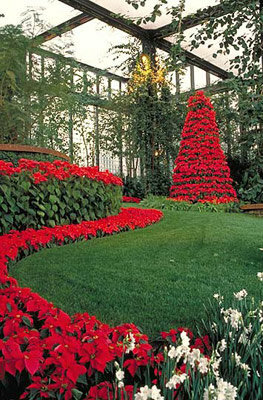 One of my favorite Christmas topics is train gardens, but I had not heard of this miraculous sight. Right now, there are eight unique areas with over 13,000 meters of track with nearly 1,000 trains. The current design requires 46 computers and over 230 employees. I am including a video of the trains with a link to the website. Although the Miniatur Wunderland does not advertise any specific Christmas trains or train activities, I learned that Germany is proud of its traditional Christmas Markets, and Hamburg’s especially interesting. Opening this year on November 25, the event is hosted by world-famous Roncalli Circus performers. Each evening, Santa visits, arriving on a sleigh in the sky. I watched a video, and I can’t exactly figure out how Santa is flying, but it’s quite the spectacle. The market advertises beautiful hand-crafted gifts, including traditional German Aachen Spice Cookies. I looked up a recipe, and I am suggesting that Jeremy and I will need to experiment with the cookies. I suspect that they will be close to a molasses/gingerbread taste. We’re going to have to find a German baker who will guide us through the process, and I have one of my mom’s friends in mind. At the auction yesterday, Jeremy and I bought a box with three bendable elves with an eye for using them on our tree for the Festival of Trees in November 2013. 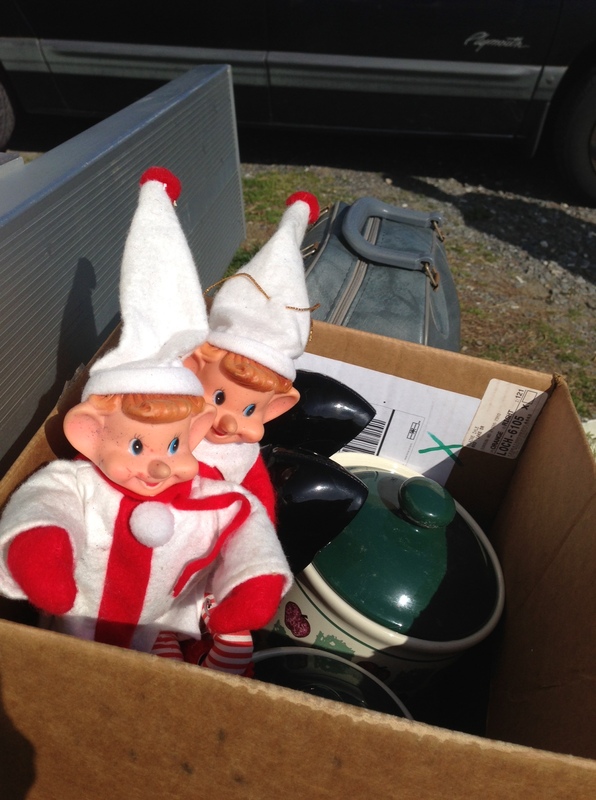 We’ve written about elves several times, including the popular Elf on the Shelf, but our treasures yesterday got me to wondering about the origins of Christmas elves. There’s no question that elves are part of ancient mythology, especially stories of Germanic and Scandinavian origin. They have both a good and bad reputation, dividing along the lines of gnomes (bad) to elves (good). Elves were not a part of American Christmas tradition until the Victorian era and a Louisa May Alcott Christmas story (unpublished) in 1950. Harper’s Weekly published a poem, “The Wonders of Santa Claus” that mentioned Santa’s elves in 1857. I’ve included a link to the curious poem, with illustrations. Godey’s Lady’s Book, America’s most popular fashion and women’s magazine of the Victorian period, is credited with popularizing many Christmas traditions, including the Christmas tree and elves. 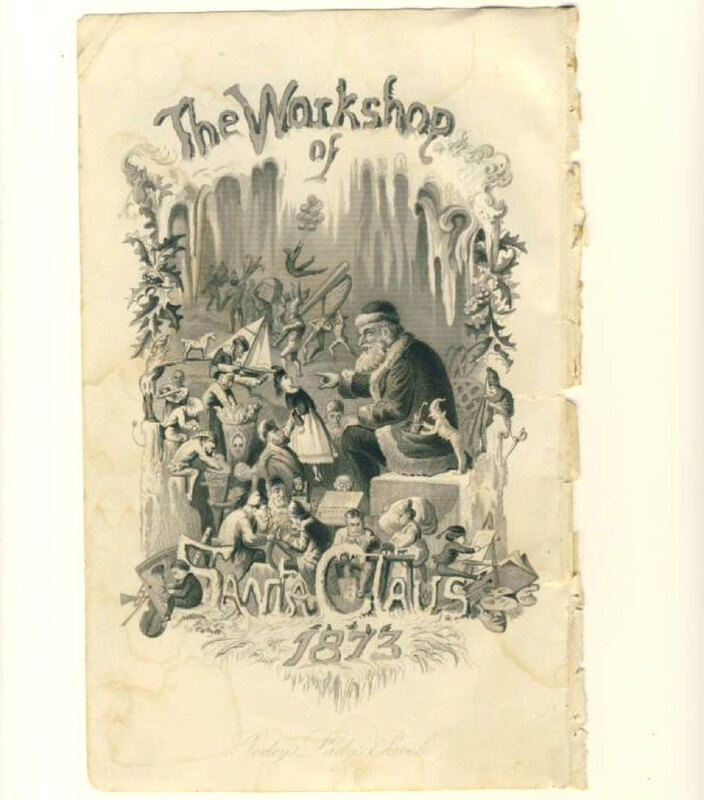 An engraving of Santa with his elves was featured on the cover of their 1873 issue. This photo is of a page from that issue. I’ve included two additional links from elfcrazy.com. This website is devoted to all things elven, and, while it’s a commercial site selling elf dolls, the information is fun to read and kid-friendly. One link offers clever names for Santa’s elves and suggestions for naming your own elf. Check them out. I’m partial to “Pepper Minstix.” Jeremy has already named our three auction elves–we’ll reveal his most clever idea as we get closer to the Festival of Trees. Podcast #54- 244 Days to Go! https://theyulelog.files.wordpress.com/2013/04/42313.mp3 Podcast #54- Click to listen to this week’s podcast- Where are the Lights? This week we are thinking forward to actual plans for the weeks before Christmas. It’s more than six months away but it’s time to PLAN that special outing, event, or trip with your family. We discuss how to get the family on board now to secure the special date. 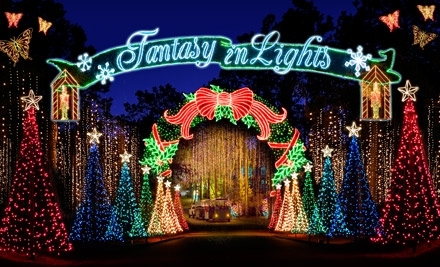 Do you KNOW where in the world you can find the best holiday light displays? Listen in to hear about the top site in America. 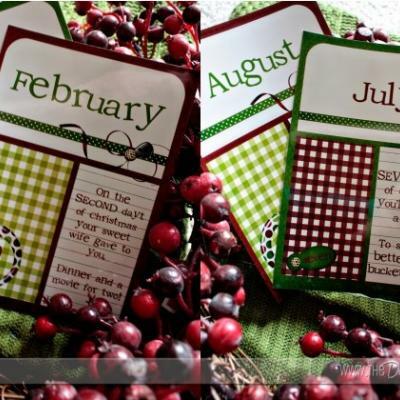 WE close with a nod to Earth Day and what you can DO to bring a little reuse and recycling to your Christmas decor. OH! We also officially announce the theme for our 2013 Festival of Trees entry. You have to listen to know! ‘Tis the season for planting a garden and celebrating the beauty of the natural world. While my giant radishes are growing (to prepare for The Night of Radishes–see Jeremy’s post on April 21), I’m looking a little closer to home for nature to inspire Christmas ideas. How about the ugly little prickly seed of the sweet gum tree? I have found the ultimate transformation of seed-to-star. This beautiful idea is posted on the PA Department of Environmental Protection website. 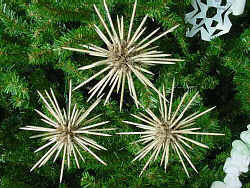 It’s a sweet gum tree seed with toothpicks glued into each hole and then spray painted. I saw examples of gold and silver. I think I’d add a little glitter, too. The downside is that unless I buy them at the craft store, I’ll have to wait until fall to pick them up on the side of the road. I think they’ll look great! Do you think of radishes when you think of Christmas? Me neither. Until now. I was reading around a little this weekend looking for different plants I might try out this year that have a Christmas connection. I was much surprised to find a good bit about the Christmas role of the radish! 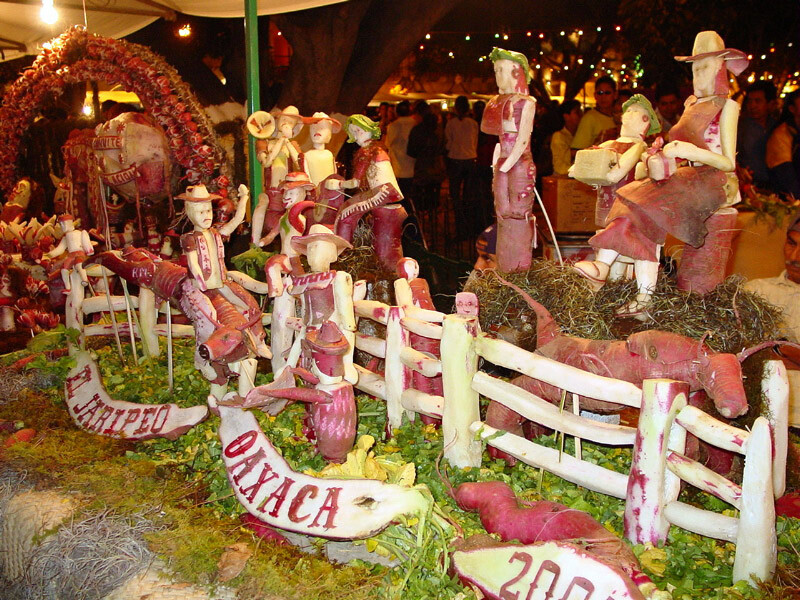 La Noche de Rabanos, Night of the Radishes, is an annual festival held in Oaxaca, Mexico. 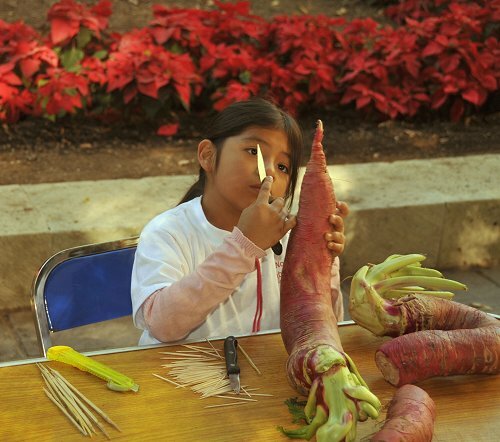 The focal point of the festival is the carved radish competition. Artisans and locals work to create elaborate and detailed scenes made out of large radishes. The carvings take on all manner of looks: a nativity, folklore, historic scenes, and even models of buildings. The carvings are presented on the afternoon of December 23rd. The displays only last a few hours, but the fun continues through to Christmas Day. There are parades with floats, dances, feasts, and fireworks. The celebrations began in 1827 and in 2013 will mark their 115th occurence. NPR’s blog The Salt had a good write-up on the happenings in 2012- check it out at Here Comes the Radish People. A specific type of radish is grown for the event. It is allowed to grow underground far past the usual harvest time. They are dug up the week before the festival. The radishes can weigh as much as 7 pounds and reach almost 2 feet in length. The practice of carving radishes goes back to the 16th century. Vendors used carvings as ways to catch the attention of shoppers for their wares. Today’s festival also has displays using dried flowers and corn husks. Radishes rate top though. The first place display wins a prize of around $1,300 US. Not sure we’re ready to enter something just yet, but sounds like a good goal for 2014!! For her brother’s wedding, Lacey (Ian’s most magnificent girlfriend) gave her brother and his new bride 12 months of anniversary dates, complete with suggestions, coupons, tickets, and cash (where appropriate). These were as small as movie nights at home with a dvd she provided and some microwave popcorn, to extravagant, including restaurant gift certificates and admission to some of their local favorites. It took a lot of planning, love and creativity–and she has all three. I’m going to transfer some of that creativity into a basket or a box of 12 months of coupons for my Christmas plan. As I was surveying my green, green grass and the brown spots bare of mulch, I was thinking that I really would have liked to receive a mulch labor gift certificate from a certain son. (I know. Dream on!) Here’s the point, though. I’m going to ask C.J. to help me with the mulch anyway, and he will probably help me–with a liberal sprinkling of grumbling. For no money and no grumbling, he could give me a gift certificate of his labors. It would be cool to make a list now of once-a-month helpful gestures that I could do for someone that I could combine at the end of the year into something really nice. Jeremy wrote about this idea last year with his nieces and nephews in mind. I know that our Aunt Susan gave a play date certificate to C.J. one year for Christmas, and he treasured it and thought seriously about when and how to redeem it. They (Susan, C.J. and Ian) used to go back-to-school supply shopping together, which took a lot of pressure off of me. That’s a great coupon idea for August. For example, I know how to do taxes (at least simple ones), and I could give that as my March or April gift. My elderly neighbor likes to go to Costco with me. I could make a coupon for that in February when the weather is unpredictable for driving. My friend Donna used to help me plant my flower pots for summer, and that could be a nice gift certificate for someone. I’m really on a roll! I could offer to do something on the computer for my parents, whatever month. This has my mother’s thoughtful stamp all over it. At Christmas, she gave Roger and me a box with, among other things, a gift certificate to do some sewing repairs for him–another coupon idea. I’m including a link to The Dating Divas. They have a Christmas plan for a His/Hers year of gift giving. That might spark some ideas for you. This final link comes from the Tip Junkie, with free printables. The labels are really cute (pictured above).